Fish on Wheels « Adafruit Industries – Makers, hackers, artists, designers and engineers! In an attempt to liberate fish everywhere, Studio diip developed Fish on Wheels, which is the first fish-controlled vehicle. “Fish on Wheels” has been developed so fish can steer their tank into a certain direction. Our pet fish have always been limited to their water holding area known as “the fish tank”. In an attempt to liberate fish all over the world, the first self driving car for fish has been developed. This car moves by detecting the fish’s position with computer vision. Up until now driving vehicles has been limited to mankind only (excluding a handful of autonomous vehicles driven by computers), but now your pet fish can also put the pedal to the metal. 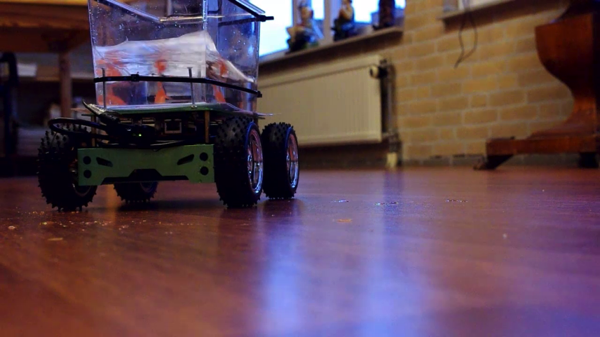 A prototype version of ”Fish on Wheels” has been constructed using a standard webcam, a battery powered Beagleboard and an Arduino controlled robot vehicle. Using the contrast of the fish with the bottom of the fish tank his position is determined and used to send commands to the Arduino for moving the car into that direction. Hopefully this invention will encourage more development in enhanced pet mobility, so pet animals can travel the world more freely. So, now to test if the fish are able to understand that they control the car. You need a way to reward the fish for certain behavior (fish treat falls into water). Then link the reward to the tank being in the proximity of an obvious sign that the fish are able to perceive from inside their tank. If this work, you can make the courses more and more complicated. In this way you are teaching the fish to drive. Very nice. But I see the water vibrate a lot. I think the fish wants smoother wheels. Also, the tank needs better acoustics. The water can now bounce around a lot. A bunch of smooth rocks will help, and plants will, too. The fish is orange enough to be able to track it between plants as well. And goldfish like to dig around, so give him some sand with large grains. You can wash out all the fine dust from the sand, so the water doesn’t get to haxy to track the fish. But, very nice project.